Jon Fjeld is the executive director of the Center for Entrepreneurship and Innovation at Duke University’s Fuqua School of Business. He’s a professor of strategy and philosophy and used to work at Align Technology, where he helped the company prevent some serious cash burn in the 1990s. 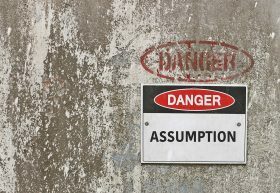 As small business owners, doctors and entrepreneurs, we’re engrossed in assumptions. What treatment options to offer, at what price points, during what days and hours of the week, in which part of town, to which target audience, to accept insurance or not. According to Fjeld, big assumptions like “patients will pay X for orthodontic treatment,” must be broken down tino discrete, manageable assumptions so that we can test them at a level of detail allowing for efficient learning. Perhaps this is why so many orthodontists’ eyes glaze over when I start talking about scientific split testing of advertisements in our multi-step, multi-media, multi-channel marketing campaigns. It’s easier to simply confirm our assumptions and biases. Fjeld’s work with Align and Rent the Runway has proven his concepts of testing assumptions tremendously successful. If your goal is to minimize the time and money expended before a key pivot or the decision to abandon the venture, then the asumptions that are least likely to be true should be adddressed first. In Rent the Runway’s example, they mailed PDF photos of dresses to 1,000 prospective customers. The response was overwhelmingly positive. People would rent dresses from a website. Thus, the cost of validating this assumption was the low cost of direct mailing, not the potentially high cost of building out a complicated website. As a small business owner, you will move forward in a constantly-changing environment. There will continue to be unknowns and you will be forced to make decisions with insufficient information. Fjeld’s strategy of testing the least-likely assumptions first and learning in small steps is brilliant.